Similar to other studies on insect attachment to pruinose substrates [8,11-13,16,18,19, 22,23,25-27], our previous experiments with C. fastuosa showed that these insects were unable to attach properly to all tested plant surfaces having wax bloom . 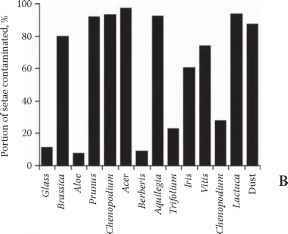 Most pruinose surfaces did not influence the attachment ability of beetles in further experiments on the smooth glass plate used as a reference substrate. It was observed that after having contact with pruinose plant surfaces, insects usually cleaned their attachment organs from probable wax contamination and, within a short time, recovered their attachment ability. Only stem of A. negundo had a strong disabling effect on insect attachment, but recovery of the attachment ability was relatively fast. It was assumed that wax crystals of this plant can probably temporarily impair the function of the tenent setae in C. fastuosa. 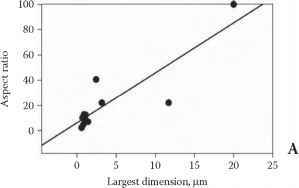 FIGURE 7.6 (A) The portion of the area of the setal tips covered with contaminating particles, (B) the portion of setae contaminated with wax crystals and dust particles, and (C) the relationship between these two parameters. 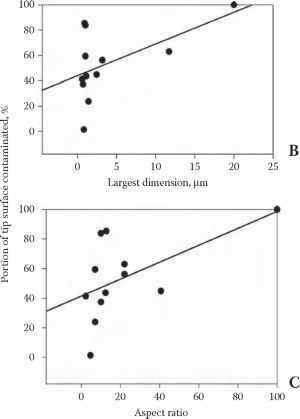 FIGURE 7.7 (A) The relationships between the largest aspect ratio and the largest dimension of wax crystals, (B) between the portion of setal tip surface contaminated and the largest dimension, and (C) between the portion of setal tip surface contaminated and the aspect ratio. It has been previously reported that insects clean their tarsi and pads after having contact with waxy plant surfaces. The grooming behavior was recorded in the beetle Paropsis charybdis after having walked on pruinose juvenile leaves of Eucalyptus nitens  and in two insect species (the fly Drosophila melanogaster and the ant Iridomyrmex humilis) after trying to climb up the waxy zone of pitchers in the carnivorous plant Nepenthes alata . It has been previously shown that crystalline wax of some plant species can contaminate attachment organs of insects. Contamination by wax of Brassica spp. 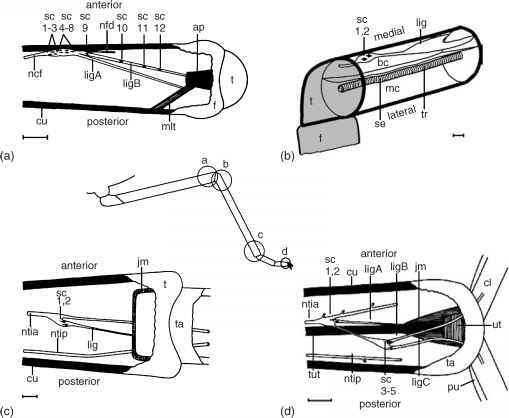 was previously observed by SEM in the beetles Phaedon cochleariae [11,12] and was also reported for three generalist predators . In carnivorous plants, the contaminating effect of wax crystals in Nepenthes sp. on pads of the fly Musca domestica has been verified with the transmission electron microscopy [5,20]. With the use of SEM, wax platelets of carnivorous N. ventrata, Brocchinia reducta, and Catopsis berteroniana were found attached to pads of the fly Calliphora vomitoria . 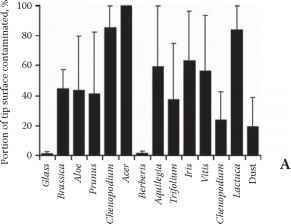 Our data on the contamination of C. fastuosa pads by wax crystals of 12 pruinose plant surfaces showed for the first time that plants differ essentially in their contaminating effects on insect's pads. Differences were found in both quality (nature of the contamination, i.e., the structure of the contaminating material and the presence of recognizable crystals) and degree of contamination (the portion of setal tip surface covered with contaminating particles and the portion of setae covered with the wax). These differences are hypothesized to be caused by various micromorphologies of epicuticular waxes in the plant species studied.